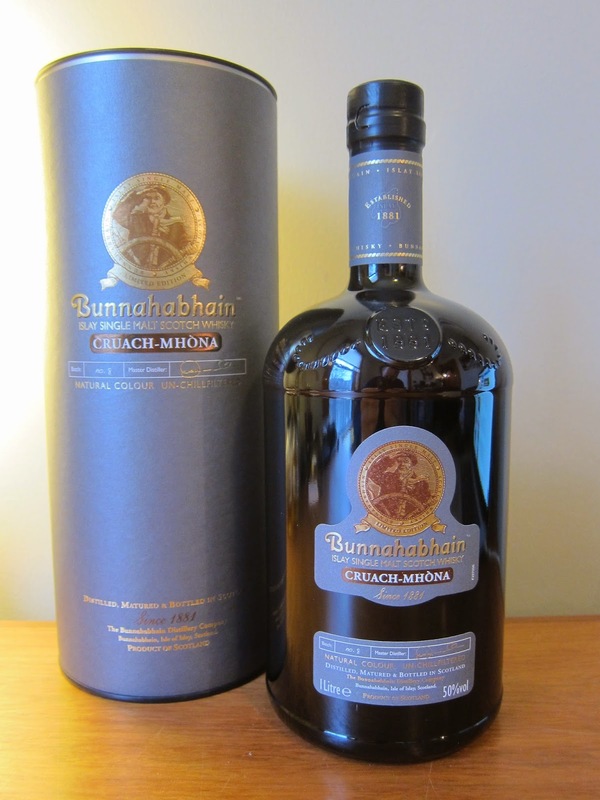 Bunnahabhain Cruach-Mhona (Batch no. 8) (50.0%): This must be an ongoing joke at Bunnahabhain distillery: "Hey guys we need another Gaelic name nobody outside of this island can pronounce... Quick, quick bottles are coming out already..." Whenever I get a bottle of these travel retail only expressions at the airport the stress starts right there: "God, please don't make me say its name out loud, please..." I simply point it casually to the guy at the counter: "That one... No, not that one, the one next to it." Then your friends ask at home: "What did you bring this time?" "The new Bunnahabhain... The one with the greyish tube... It's quite nice." Well, after a quick research at least I found out that Cruach-Mona means "stack of drying peat bricks" (duh...) but still have no idea how to pronounce it. It has to be peaty though, that I get it... Color: Clover honey, medium amber. Nose: Granny Smith apples and yellow grass. Almost like a hay stack left on the field to dry. Bonfire on the beach smoking still the day after, candied pecan and cinnamon dust. It gets less grassy and more fruity in time: Dried strawberries, dried papaya and black currant marmalade. Water pulls the aromas back to the grassy side: chamomile tea and sage. Palate: Char, fresh mint and golden raisins. I saw it in its color first but now I can confirm that there is a good amount of sherry casks in the vat. Warming and soothing. Manchego cheese, pine resin and rosemary. Cigar ash and dulce de leche cake. Water? It thinned it out the whole thing a little. Finish: Long with charred oak staves, cinnamon and honey. Overall: Well if you buy a bottle without knowing anything about it in a crazy rush to catch your connecting flight the expectations are usually pretty low. But I think I scored quite good with this bottle... It is a little off balance like any other NAS Bunnahabhain expressions I tried before but I kinda like this style. It tastes like a not well-behaved Bunnahabhain 12yo which is one of my favorite go to Scotches all time. Loved the sherry cask influence, overall grassiness and the dry peat. Highly recommended for the peat lovers.